I wasn’t sure how to name this post… many ideas came to mind, like:“What to do with cactus pads”, “Some recipes using nopales”, etc., and the list could go on a few more lines, but I decided on just: “How to cook Nopales – cactus paddles” and I hope you find them easy to prepare. The weather is getting warmer here and instead of the same old lettuce, tomato, etc., salad, I decided to make a nutritious Ensalada de nopales. We do not get the freshest nopales around here but, who’s complaining? You can see in the pictures that they look close to their expiration date, with dark spots here and there, but they were still crispy and that is what matters when you choose the nopales. (If they are soft and bendable, do not buy them). Today I also have the recipes for Nopales Salad and Nopales with Eggs. Nopales with eggs!!?? What?? Am I out of my mind?? Well, that is exactly what I told my husband as a newlywed almost 30 years ago. (Yes, it has been that long but seems like yesterday… believe me!) Anyway… The thought of eating scrambled eggs with nopales for breakfast and in a sandwich didn’t sound too interesting to me back then. But here I am now trying to convince my teenage son that they taste good… plus the added bonus of all the health benefits found in nopales that even Asian countries are cultivating them, while in México they are becoming extinct in some areas. Now… Let’s go cook some nopales!! Repeat the same steps with the rest of the cactus paddles. Finally, rinse the cactus paddles and take them back to your clean cutting board. Place a medium size pot with 4 quarts of water to boil. Cut the cactus paddles into small strips. Once the water is boiling add the cactus, onion, garlic, 1/2 tsp. of salt and the tomatillo husk. Boil uncovered for about 8-10 minutes or until tender. The cactus will exude a sticky substance and most times will foam, so, pay special attention to this step to avoid the foam to spill over. Once cooked, drain and rinse the cactus. Let them drain completely or pat them dry with paper towels. Now, your nopales are ready to be prepared into salads, scrambled eggs, as an addition to your Mexican stews, etc. Note: Nopales also taste really good grilled and topped with melted cheese. Just make 3-4 small cuts to each nopal after you cleaned the spines; brush them with oil and grill them for about 3 minutes on each side. 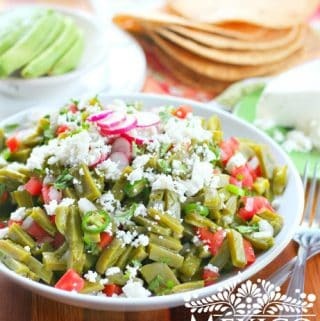 Place the nopales in a large bowl; add the chopped tomato, onion, serrano peppers and cilantro. Mix the ingredients. In a separate bowl mix lemon juice, olive oil, oregano, salt, and pepper. Add this to the nopales mixture and stir. Top the salad with crumbled fresh cheese and avocado slices. (Radishes go well with this salad also). 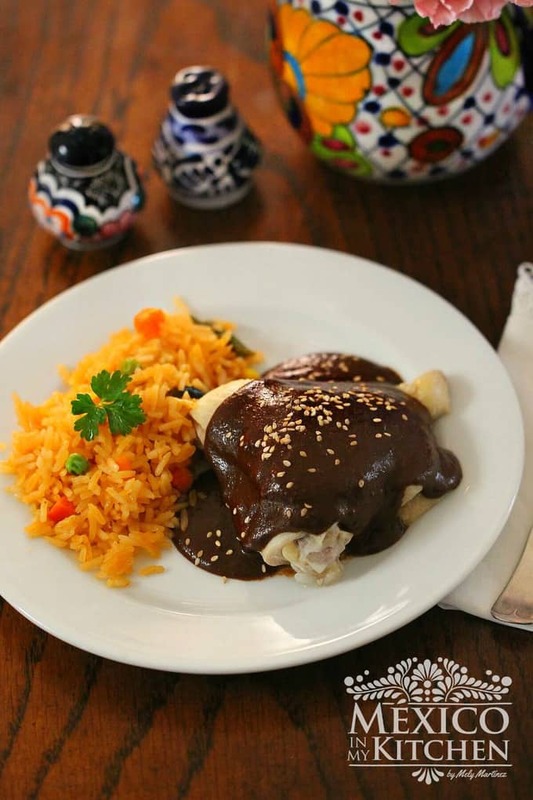 Eat with corn tortillas or tostadas. Add the oil to a frying pan over medium heat. Add the chopped green onions and stir-fry for a minute. Add the nopales and cook for 1 – 2 minutes. Add the eggs and cook until tender, stirring as needed. Add salt to taste. Cactus Paddles - Today I also have the recipes for Nopales Salad and Nopales with Eggs. Nopales with eggs!!?? What?? Am I out of my mind?? Well, that is exactly what I told my husband as a newlywed almost 30 years ago. VERY IMPORTANT TIP: Use kitchen tongs to hold the nopales or, better yet, wear gloves to protect your hands from the thorns. Once you are familiar working with cactus paddles then you can try to clean them without gloves. 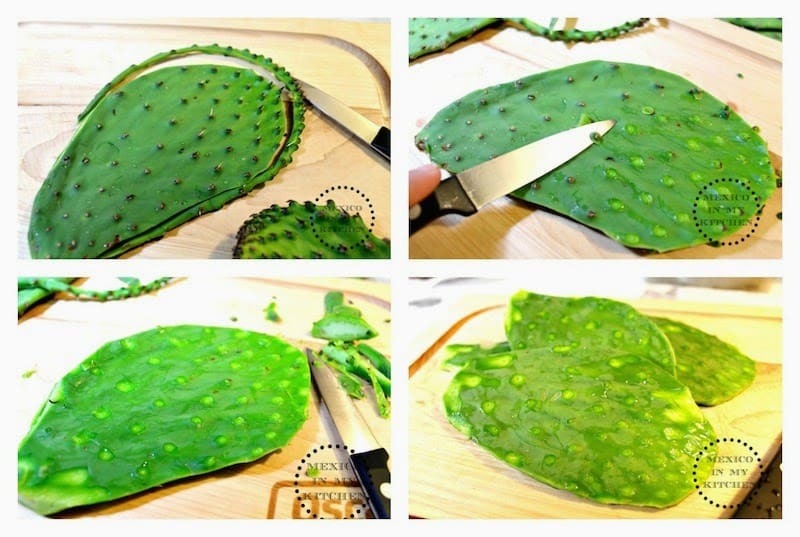 Place the cactus paddle on your cutting board and, using a sharp knife, trim off the edge. Scrape the spines, thorns or eyes, running your knife from back to front until completely clean. Turn the cactus paddles and do the same on the other side. Nopales also taste really good grilled and topped with melted cheese. Just make 3-4 small cuts to each nopal after you cleaned the spines; brush them with oil and grill them for about 3 minutes on each side. 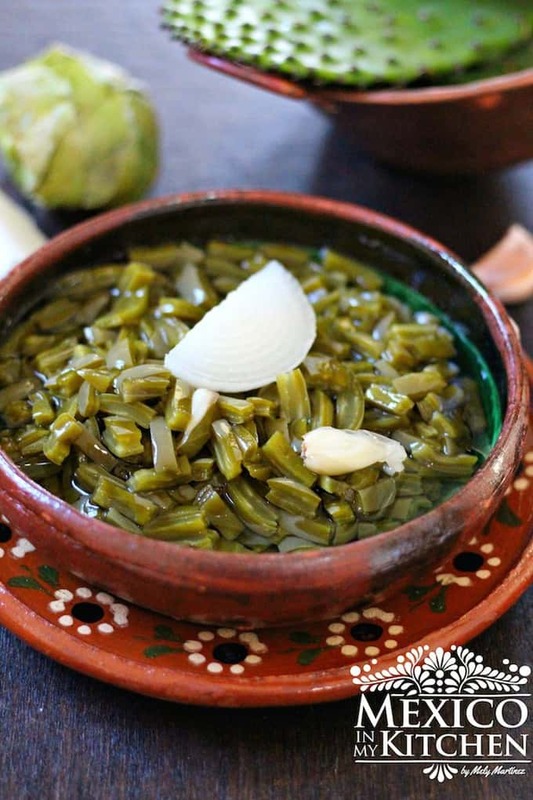 More recipes using Nopales: Grilled Cactus Recipe, Nopales Smoothie, Nopales Recipe, Fava Bean and Cactus Soup. 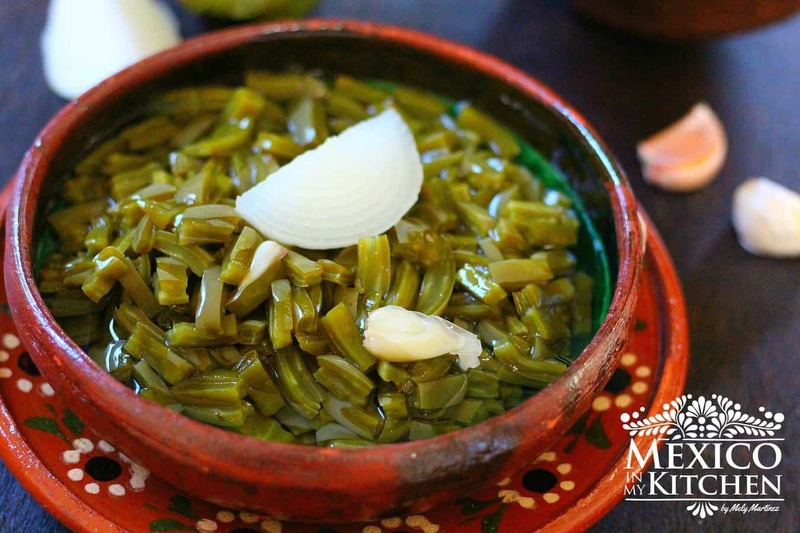 Receta en Español Cómo cocinar nopales.